Ever-evolving and forward-thinking, the team here at Dakno is always exploring new and innovative ways to keep you and your clients as successful in their goals as possible. So let’s play a little real estate game to see how the new Dakno updates benefit you. You be the home buyer and picture the following. You’re cruising the web, settle for what appears to be user-friendly real estate website and after what seems like hours spent searching for your dream home, you finally find it. There it is right in front of you in all of its glory. You look at the clock and (on no!) it’s time for your son’s baseball game. You click “Save” to add this listing to your profile and you’re taken to another page altogether. Shucks. You forgot to log in! Time’s a’wasting and you have somewhere better to be right now. Little Johnny is hurrying you out the door. The problem is here you are routed to a completely separate page to either log in or sign up before you can save your search. Oh, dear. This frustration and wasted time is exactly what your clients would experience when trying to save a property or a search having failed to log in at some point. Should they be penalized for forgetting that little detail? The survey says “NO”. Dakno proudly presents modal dialogs. With a modal dialog, the individual will no longer have to log in to prevent being forced to another page before a search can be saved. That’s soooo last week. Welcome to the now. When a client fails to sign up or log in and clicks “Save”, going forward they’ll see a convenient pop-up that asks for their login info. Once they login, the search will be saved without ever leaving the listing page. For those that need to sign up, a couple of additional pieces will be needed but their experience will be the exact same. A second saved is a second earned. Actually, it’s a “penny” saved but seeing as time is money, it still applies. Save your client time and they’ll hold faith that you have their best interests at heart. It’s the little things like modal dialogs that set Dakno clients apart from the average agents and brokers of the world. Have you ever wondered exactly what listings a particular home buyer is looking at on your site? You gain their contact information voluntarily or through a forced registration and that’s terrific, but, what were they searching for? It’s time to put that curiosity to bed. 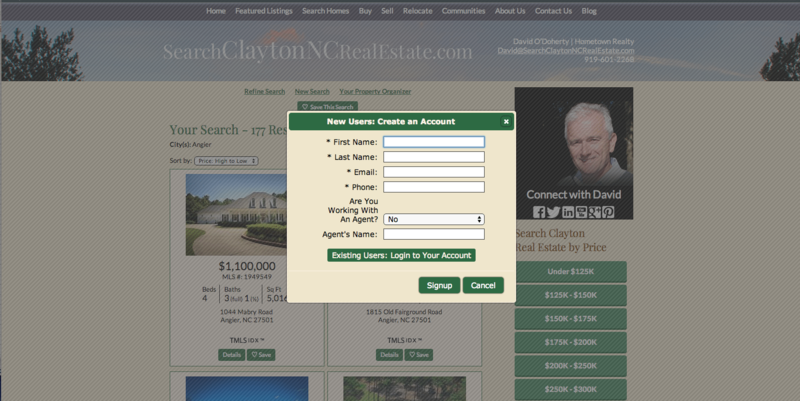 Our latest update to the Dakno Admin now shows you the most “Recent Searches” from home buyers browsing your site. Imagine the applications here. Gone are the days where your initial follow-up on a lead is wasted trying to determine what they’re in the market for. You already have the answer. It not only records the area or neighborhood, but, it saves the exact listings. That means you know your lead down to the price range and can begin tailoring your follow-up campaign accordingly. Also, by being ahead of the curve and knowing what your lead wants, you’re guaranteeing your introductory follow-up now has substance. This can be the difference between wasting time breaking the ice or setting up a home viewing. Again with the time-saving? Sorry. We’re kind of addicted to it. Please don’t tell our parents. As we continue to improve our Dakno Admin and look for ways to help you be successful, we understand that this is a partnership. We are only as good as our ability to listen to the needs of our clients and act to resolve them. So keep those suggestions coming and always know that we will never rest until….well…scratch that. We will never rest! Feel free to reach out to us at any time for any reason. We love speaking with you!